isaac mizrahi is one of those designers who has had many incarnations. he exploded into the american fashion scene back in the late 80s, along with other young american designers who represented the new generation: marc jacobs, anna sui, todd oldham, donna karan... then in the 90s, perhaps for lack of funding, his eponymous label shut down. it was surprising because it seemed like his collection of typical american sportswear with clean lines, happy colors, and classic details wouldn't be hard to sell. we remember there was even a time rajo laurel was supposed to apprentice with isaac, but rajo was deep into establishing his business then that taking a year off might have made him lose his momentum and the public might forget him. anyhoo, isaac went on to become a TV host, book author, comic-book illustrator, "couture" designer, and, his most popular incarnation yet, designer for target (pronounced "tar-zhay" ;-). but the target days are over because isaac mizrahi's got a new job: creative director of liz claiborne. 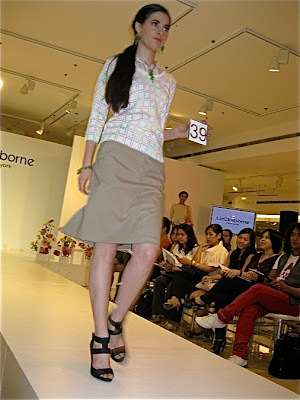 liz claiborne at rustan's? seriously?